Once New Yorkers feel that chill in the air, it’s time to start thinking about skiing. The more avid skiers and snowboarders among us already have purchased season ski lift tickets in anticipation, designating weekends for road trips to the mountains. For me, however, I’m going to be honest, resorts have to offer something more than just skiing—such as an incredible spa or breathtaking views. Where I come from, the Dominican Republic, throwing oneself off an icy mountain is not what what we call “fun.” We also don’t necessarily like spending hours in shoes that are supposed to hurt till your feet are so numb you no longer care. I know gringos go gaga over these types of winter activities, and I married a gringo, so I have a good idea of what makes for an ideal ski destination. Thankfully, New York City is close to a number of these, and many of them offer other amenities that someone like myself will love. Viewfinder tip: Before you rent a car to get to New York-area ski mountains, check into shuttled tours, buses, or trains to your ski destination of choice. 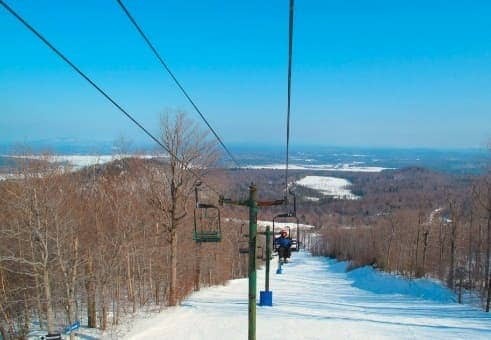 Hunter Mountain is the most popular mountain for New Yorkers because it’s only two hours from the city by car. Because the mountain is so close, it also usually is the most crowded; weekdays and weekend mornings are the best time to visit to beat the throngs, Options at Hunter are varied; my ski-loving family loves all the variety of trail options, making it easier for anyone to find a slope that fits his or her skill set. And while the rest of my gang are all out there freezing their butts off, I’ll be relaxing in the Mountain Club Spa, drinking champagne and admiring the mountain views. Now, if I am going to throw myself off a mountain—and believe me I have—I will do so for two reasons: 1) my instructor is super-hot and worth trying to impress or 2) the reward is a resort stay so luxurious that it will melt the tensions from the day away. One of my favorite luxurious New York-area ski/spa getaways is Whiteface Lodge overlooking Whiteface Mountain in Lake Placid. Granted, this is a bit of a further drive from the city (almost five hours), but the luxury is worth it. Sign up for the full-day Whiteface Signature treatment, which includes two different 80-minute treatments and lunch. Suddenly jumping off a cliff with two flat wooden planks stuck to your feet doesn’t seem like such a bad idea at all. Another way to relax is to hit the bar and check out the 25 different single malt Scotches or the different cocktails and martini options on the menu. If you like eating when you drink, chefs and mixologists can pair these libations perfectly with delicious food. The mountain itself is known as the Olympic Mountain, since it is was the site of the 1980 Winter Olympics and is where many more recent Olympians have come to train. In addition to skiing, guests can take part in fun events such as bobsledding, luge riding, snowshoeing and ice-skating, just to name a few. Kids can stay busy on the mountain or at the resort’s kids clubs, Kamp Kanu (during the day) and Sunset Club (at night). As for me, the next time I visit Whiteface, I likely will be by the fire with my feet firmly on the ground, martini in hand, admiring you locos from the window. How do you like to enjoy ski resorts in winter?